I’ll leave the ‘body’ (nutrition and training) issues to someone else who knows about this subject. I’ve already talked about braking in an earlier article – minimise braking, brake as lightly as possible, and smoothly; rear-wheel-brake mostly, and cadence brake the front if you need it. Braking is a key point in ‘Behaviour, above’ and in doing it properly the benefits are massive. But, starting, under ‘Bike’, let’s give a bit of thought to how the brakes on your bike perform. After pondering this, I just don’t ‘buy’ the argument that ‘you don’t need powerful brakes on your bike because you should be looking ahead and anticipating’. We should all ride this way at all times, but my argument runs like this. When riding, we need to concentrate on the Limit Point of Vision, particularly on twisty roads when our view is often restricted. One’s maximum speed should never exceed one’s ability to stop within the distance ahead seen to be clear. Ignore this basic rule and one WILL crash, and only question is when!! If your brakes are gentle rather than powerful, you need a longer stopping distance and you’ll have to ride slower to be able to stop in your line of sight. So, on twisty downhills, you can’t keep as much of your hard-won momentum, making your cycling harder and slower. Remember what I said on page 1 - "Never lose your respect for something that could kill you, and that includes your bike". Perversely, you can travel faster on twisty and steep roads if you have more powerful brakes. On open roads your braking power has little impact on the speed you can maintain, but this is lumpy Devon and it matters. Only last week was I cycling near Cadeleigh and Tiverton and coming down a steepie on my audax bike, which has side-pull calliper rim brakes. These are just not very powerful and I couldn’t be confident of stopping quickly if a vehicle came up. What’s the point of an audax bike if it can’t travel swiftly in all conditions? Yes, I’ve now ordered new brakes! To make the best of the brakes you have, first, make sure they are working properly. Brake levers should operate ‘like silk’ with no hint of notchiness or grating, and should be light in operation. Most bike builders (including high-profile names) are not fussy enough to make sure that when cables (inners and outers) are cut, the ends are properly smoothed off. Also, you can change rim-brake and disc-brake pads for softer or harder material to make your brakes more effective or durable. c)	Braze-on bosses for disc brakes. There is a good selection of disc brakes to choose from, in a variety of prices, and a choice between hydraulic and cable operation. Most, not all, are very powerful and progressive, but they can be graunchy, delicate, binding, difficult to keep adjusted, take time to bed-in, and like-for-like they are heavier than rim brakes. (Yes they are !). You cannot safely retro-fit disc brakes to your existing frame and forks because they impose much greater torque forces – you risk breaking something. However, you can replace your fork with one purpose-designed for a disc, and I’ll a describe a very successful disc-brake conversion I did next time. We all need to be reminded about the safety stuff from time to time so as not to practice in bad habits. So, what direction do you look first when approaching give-way lines (in UK, that is) ? Next time you get an opportunity, just stop and watch which direction most drivers and other road users look, and I’ll bet you it’s left first. If they really are compounding their mistake, they’ll start to move over the lines before looking right, or, at the same time. If the luck’s run out it’s splatt crunch, or the squeal of brakes, with or without the swearing. Many pedestrians don’t even look before stepping off the pavement. Stay safe - be mindful of the mistakes other road-users make and prepare to take avoiding action. CTC’s safety training teaches us to position a bike about a metre or so (4 – 5 feet) from the edge of the road. One easy way to do this, in the UK, is to line up your left hand brake lever top with the edge of the road or the kerb. This will readily put you in the right position. If you ride straight bars, then you might have to line up a slightly different part of the handlebar, but you get the idea. Once riding this position, don’t be pressured by drivers or traffic to give it up. It’s your safety space when some ‘clout-head’ wants to impress the girlfriend by skimming the lycra off your elbow, it’s your wobble and pothole space, and most importantly it puts you in the driver’s line of sight. Oil (cyclists have a big advantage as we can normally smell diesel oil a long time before it becomes hazardous. Wet white lines (surprisingly scary because they can be both slippery and smoothly lumpy). I’m sure you can think of others. On the flip side I can’t think of many shiny bits which are good news.....can you? Best avoided, then ? And, if you find yourself on this slippery stuff, don't panic, brake, turn, accelerate, or even breathe. Great delicacy is the key to verticality and survival. Oh, and luck ! Sounds a bit preachy this one, but read on as it does make sense! A cyclist can only truly ride safely when he / she knows the capability of the bike and rider in all conditions. So, to know your limits, you need to test and stretch them from time to time. Go back to being a kid for a bit and where it's safe, play with the bike's handling, on tarmac and different surfaces and gradients. You will be amazed at what you can do (and sometimes what you can't !). Use the knowledge to improve your riding technique to keep you safer when the going gets really tricky on the road. Practise raising your eyesight by looking as far ahead as possible. Anticipate hazards, read the road ahead and ask yourself the 'what if's". By looking and planning far ahead your riding will become smoother, more efficient, and, above all much safer, whether you ride by yourself or in a group. And you'll probably earn the accolade of being 'a lovely wheel to follow' ! On a bike, as in a car, you go where you look. Have you ever wondered why If you see a hazard like a pothole or stone in the road you have a helluva job to avoid it ? This is the principle in action - in this case against your interests ! Ride positively. DO concentrate on where you WANT to go, and DON'T concentrate on the hazard or where you don't want to go. Braking is bad news. Try to think of it as salt and pepper in your soup – a little is necessary for life, but too much makes your soup, and your cycling unpalatable. Let me explain why... All a brake does is convert the energy in forward motion into heat. Think about it, how does heating up your wheels help your cycling ? At its worst, heat builds up on long descents, can warp brake discs and has been known to break spokes, damage tyres and so possibly damage you. Even if you’re riding, in total contrast, on cold wet days, with rim brakes and standard alloys, that nasty black gunk on your rims, spokes, luggage, and eventually hands, is actually your rims wearing happily and quickly away underneath you. (Your rims could be history in 12 weeks of a winter season, so go out and check ‘em if you value your safety). And it gets even worse; by braking you are making your bike, by definition, less, not more, stable, so - and this is important - you may not be adding to your safety at all. 'Slower' may be neither safer, nor easier. Think about applying brakes when on gravel or ice to get the point, but the principle really does hold for all surfaces. When things get really tricky, using the brakes is a very good way to take an unplanned close inspection of road or scenery. And the bad stuff’s still not over because braking while riding in a close group can be extremely hazardous to following riders unless you warn your group with voice warnings. The first your fellow rider might see is your back wheel apparently coming towards them surprisingly fast, which could get a touch tricky if following at less than wheel diameter away. (and many chain-gangers follow much closer than this). So why use the brakes ? Well, we might think our speed is too fast (for our ability to control the bike) in the particular road conditions developing. It might also be what I call 'habitual braking' or 'comfort braking' - it's what we do habitually when we come to a corner isn't it ? Well, try and break the habit by asking 'why?' every time before braking. So, we might feel it necessary for continued comfortable progress - or survival - to brake. But, turn it the other way round, if you want to improve your riding, try to reduce the need to brake at all - look ahead, anticipate and assess road conditions riding within your abilities. But remember - braking is hazardous. I’ll end with one technique which has kept me very safe. This is rear-wheel braking. I do most of my braking on the rear wheel for good reason. When one brakes, weight transfers forward, which increases weight and friction at the front, and reduces weight and friction at the rear. This reduced friction at the rear wheel gives me advance warning of tricky conditions when and if the rear starts to ‘kick’ or slide a bit. I'm safe as I’ve still got the more powerful (but more feisty) front brake to top up my slowing down but I've just gained very valuable information about exactly how slippery the road conditions are, and I can use this precise information to keep me safe. And if the rear wheel does ‘break away’, it's much easier (and fun!) to control than a front-wheel ‘break’, which can be catastrophic. The latter is another superb way of unintentionally inspecting parts of the planet not on one’s itinerary. Moral of the story – continually try to improve your riding skill-set and read the road ahead. Try to improve your bike-handling skills: corner by outside weighting and positive / counter-steering to keep you fast and safe. This will allow you to keep off the brakes as much as possible. If you must brake, keep off the front brake unless it's absolutely necessary, and even then use cadence (pulse, not constant) braking to keep as much grip as possible. One member quotes an accomplice who says “ brakes are for emergency use only”. A bit extreme I agree, but you get the drift.......(drift – get it ? ....). And here's another 'opener'....If you can lock up front or rear wheels easily on a bicycle equipped with disc brakes, then why do you need two of them, with their weight penalty, on one bike ????????? 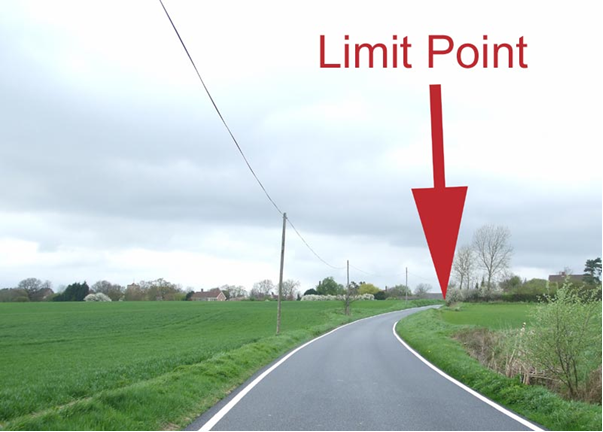 When approaching, and going round a corner, it's best to concentrate on the "Limit Point" - it's the furthest point you can see uninterrupted round the bend. Reasons – What you can see is fundamental to your safety, and, you go where you look – so look where you want to go !!!!!. You’ll hear lots of fish-wives’ tales about limit points. I’d heard that if the limit point is coming towards you, you’re going too fast, and conversely if it’s going away, you can speed up. This is a gross over-simplification. A moment’s thought reveals all. If the maximum distance you can see (which is to the limit point by definition) is reducing, it doesn’t necessarily mean you are going too fast. But it does mean that conditions are deteriorating and that you might get to the point where you cannot stop, if you had to, within the distance you can see. At that point you ARE going too fast. Conversely, if your line of sight is lengthening, that doesn’t mean you are riding safely and within the speed which would allow you to stop within your sight distance. It just means that conditions are improving. This page was last edited on 15 September 2017, at 18:18.